As the earth’s climate continues to change and the weather becomes increasingly unpredictable, the wild animals suffer the most. Devastating droughts after devastating droughts have turned East Africa into a scorching hell for both animals and people. However, being unable to buy food or water, and consistently neglected in the drought mitigation strategies laid out by governments and NGOs, the wild animals of East Africa face a dark, thirsty future in which the horror of total extinction is possible. 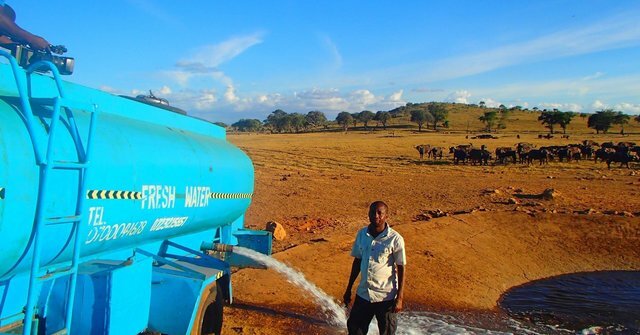 Today, for the WE ARE THE WORLD BLOGFEST #WATWB, I share with you the heartwarming story of one extraordinary PATRICK MWALUA, a Kenyan pea farmer, who drives through 70KM of dusty road in order to provide drought-stricken wild animals with fresh water. The video of his interview is found HERE. The following synopsis and images are from The Dodo. 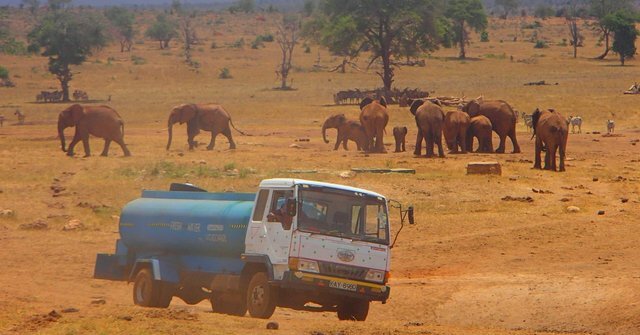 ‘In a land as parched as Kenya’s Tsavo West National Park, no visitor arrives with more fanfare than the water man. That would be Patrick Kilonzo Mwalua. And when he rumbles down the dusty road bearing some 3,000 gallons of fresh water, the elephants, buffalo, antelope and zebras come running. They’ve come to know the water man by the rumble of his engine. And his lifesaving cargo. Mwalua fills the bone-dry watering holes in the region, driving for hours on end every day to haul water to where it’s most desperately needed. 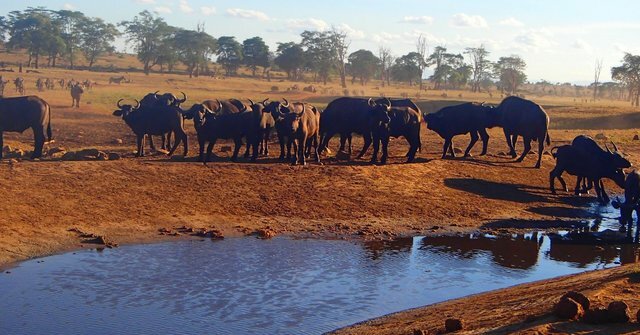 The holes themselves, lined with concrete, often need cleaning – Mwalua blames it on buffalo droppings – and sometimes, he will just hose down an area of cracked earth for the grateful animals. Mwalua, who is a pea farmer in his local village, came up with the idea after seeing firsthand the grim toll climate change has taken in his native land. In the last year especially, he says, the area has seen precious little precipitation, leaving animals to die of thirst in these cracked lands. This is the fourth celebration of the WE ARE THE WORLD BLOGFEST #WATWB which is carried out every last Friday of the month, and which aims to spread love and positiveness in this vulnerable world. A celebration of heroes who can still restore our faith in humanity, especially in this period when our world seems to be full of endless series of horrible happenings. 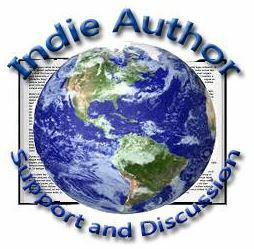 Our generous co-hosts for this month are Michelle Wallace, Lynn Hallbrooks, Belinda McGrath Witzenhausen, Sylvia Stein, and Sylvia McGrath.